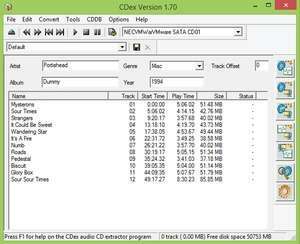 CDex is a CD audio data extraction utility which can rip audio files from your CD-ROM drive. The resulting files from the process are mp3 files or other encoded formats, or if you choose so, a simple uncompressed WAV file. Several encoders are supported, they include Lame MP3 Encoder, Internal MP2 Encoder, APE losless audio format, Windows MP3 encoder and the Windows WMA8 encoder. CDex can directly record single or multiple CD tracks, read and store data in the cdplayer. For security reasons, you should also check out the CDex download at LO4D.com which includes virus and malware tests. Additional screenshots of this application download may be available, too. 4.72 out of 5 based on 18 ratings. CDex has a presence on social networks. CDex download been highly rated by our users.